Andrew "Browndog19" Brown won the Full Tilt Poker $25,000 Heads-Up Pot Limit Omaha Championship on Saturday, successfully navigating through a shark-filled field to take down the title. 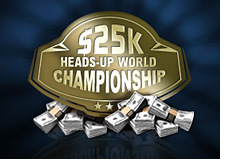 35 players turned out for this event, which meant that the total prize pool was $875,000. "Browndog19" took home $393,750 for his first place finish, while "UgotaBanana" claimed $218,750 as the runner-up. "BigBlueBonzzzai" and Alexander "PostFlopAction" Kostritsyn were eliminated in the semi-finals of the event. Both players took home just over $131k for their troubles. The event, which normally attracts thousands of railbirds due to the participation of big names such as Phil Ivey and Patrik Antonius, was largely ignored due to the epic "Isildur1" vs Ivey and "Isildur1" vs Antonius cash game battles that were taking place at the same time. I mean, you had the biggest online cash game pot of all time take place today ($1.35 million dollars, won by Antonius). You had Antonius sitting with a $2.4 million dollar stack at one point. You had Phil Ivey sitting with two million dollar stacks simultaneously. How could the $25k PLO Championship possibly compete against that? Speaking of "Isildur1", he ended up finishing in 6th place in the event. Only the top four finishers were paid, so this just further added to his losses on the day. Cole South (5th), Tony G (12th), Phil Ivey (13th), Gus Hansen (14th), Patrik Antonius (22nd) and Annette "Annette_15" Obrestad (24th) were some of the big names that failed to cash in this event. The tournament was originally supposed to be paused after the semi-finals were set, with the action picking up on Sunday afternoon. I guess FTP just decided to play it through due to the small turnout. "Slaktarn", who won the event last year, did not participate.